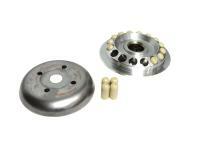 Variator / vario Turbo Kit for Yamaha Majesty 400cc 4T LC older before 2007. The best racing variators available with circular capsule rollers made of carbon and nylon they slide in / out new variator in order to increase and improve the performance of your maxi-scooter. You will achieve better acceleration, greater gas mileage, less vibration and no roller clanking. Upgrade your stock scooter for a smoother ride Comes with weights.